Bow Street Market recently reopened in huge, new digs (can you say wine store?). Quite a step up for a great catch all market that was my first hint of what NYC bodegas would have in store for me--seriously, I don't know how those stores manage to stock so many things in such little space. The first thing I noticed at the new store was the sandwich menu at the deli. 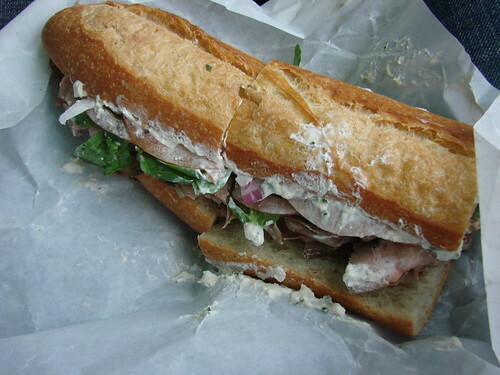 This menu isn't listed online, but they have a fantastic Roast Leg of Lamb sandwich that's to die for. 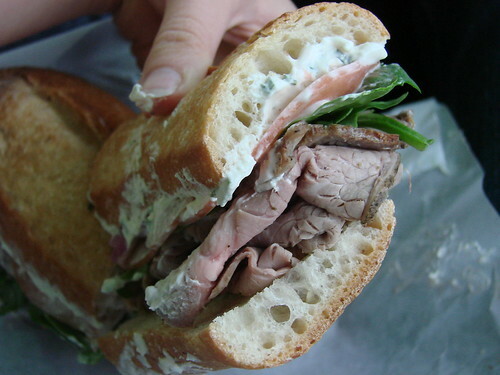 Served on a baguette with a herbed cheese spread, lettuce, tomato, red onion, and a more than generous portion of perfectly roasted leg of lamb, this handsome sandwich clocks in at only $5.99--the lamb alone goes for $15.99 a pound! Awesome deal. The only catch is they don't always have the leg of lamb in stock. Still if you love lamb and you're willing to walk just a few blocks off the beaten path you'll be well rewarded with a trip to Bow Street Market. That sandwich looks awesome. Curious as to how the herbed cheese spread compliments the lamb...seems like it could be a natural fit. And definitely better, flavor-wise, than slathering it with an oily mayo, especially in the hot summer months.